Central to all models of life coaching is the belief that people have a capacity to change their own lives. This capacity can be diminished or constrained by many factors, both internal and external to the person. Change can come from many different places, sometimes surprising, unanticipated and out-of-the-blue. At other times, the impetus for change might be right before our eyes if we can only look keenly enough or from a different perspective. While the key catalysts of change can be hard to script there are some recurrent themes. Firstly, discovering one’s unique set of values is important. What is really important to me? Secondly, understanding both ourselves and others is important. One of Franklin Covey’s habits of highly effective people is ‘Seek first to understand’. Can we say we have achieved real understanding of ourselves—who I actually am? Can we really claim understanding of others when we so often carry around huge sets of assumptions? Such questions are worth revisiting along the way. Thirdly, the antidote to living life through untested assumptions is curiosity. What do we question and wonder about? What intrigues, challenges, annoys and mystifies us? One thing emerged clearly from the many animated discussions that took place around the development table for Life Tweaking; we all agreed that values, understanding and curiosity are fundamental catalysts of change and ingredients of coaching. It is no surprise, then, that we have tried to bring these themes alive in the Life Tweaking card set. Leonard Cohen sings in his song Anthem: ‘There is a crack in everything. That’s how the light gets in’. Life Tweaking is based on the belief that small cracks or tweaks can be just as transformative as the huge seismic shifts for which we sometimes yearn. For every blinding conversion such as the Apostle Paul’s on the road to Damascus, there may be innumerable ‘sparkling moments’—illuminated by shafts of light penetrating through little cracks. These cards are one way of building small cracks in the traditions and routines that constrain our lives. Some of our habits can lock us into patterns of behaviour that are limiting and unfulfilling, and others can lock us out of feelings of success and satisfaction. These habits can be quite entrenched. Walls can seem impenetrable. But cracks can appear if we continue to ask useful, gently-challenging questions. As David Cooper-Rider, one of the developers of Appreciative Inquiry, has said, ‘Humans grow towards the questions they persistently ask’. Just as cracks can be small and seemingly insignificant, so too can be the events that prompt us to change. Sometimes in our search for change we imagine that the impetus has to be big. We can tend to think that to shift the inertia we feel, the change has to be a 360-degree turn or a cataclysmic event such as a meteor hitting earth or a tsunami. Sometimes the term ‘life coaching’ implies such a seismic shift. The one hundred questions contained in the complete set of Life Tweaking cards are intended to be used simply for noticing and opening up the cracks. 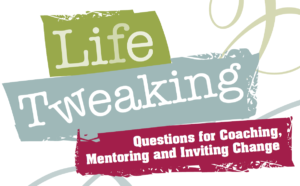 We purposefully called our coaching cards Life Tweaking to highlight the significance of small changes—baby steps, if you will. These small changes can be the cracks where the light comes through, and small cracks can create momentous change.